This beautiful Abilene Swivel Bar Stool is handcrafted of solid wood and has a convenient swivel. The French Country design along with expert craftsmanship is sure to impress! The wood is beautifully finished for a magnificent appeal. Allow us to introduce the timeless beauty of solid wood furniture to your home with the Amish Abilene Swivel Bar Stool. The French Country style exudes a relaxed elegance and pieces do not have to be paired or matched for this style to shine. This Abilene Swivel Bar Stool displays three horizontal back slats in the chair back that curve gracefully as they support your back. 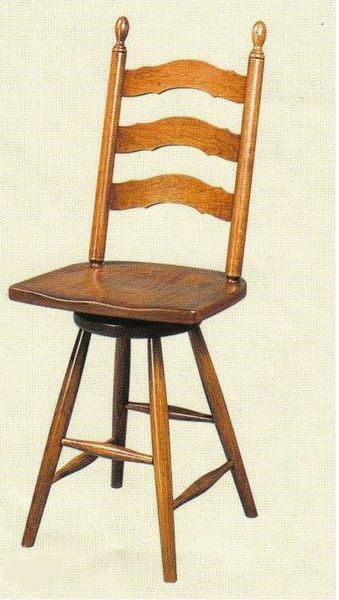 Customize these Amish bar stools in your choice of oak, cherry or Brown Maple wood. Amish made bar stools provide a wonderful option for your kitchen seating. Enjoy casual meals at the counter or bar and rely on your bar stools during those large parties when the dining room is full and the crowd spills over into the kitchen. If you prefer a chair without swivel then check out our Amish French Country Bar Stool. Review our entertaining blog post, Cheers to the Perfect Home Bar Space, for a printable checklist of your home bar essentials.